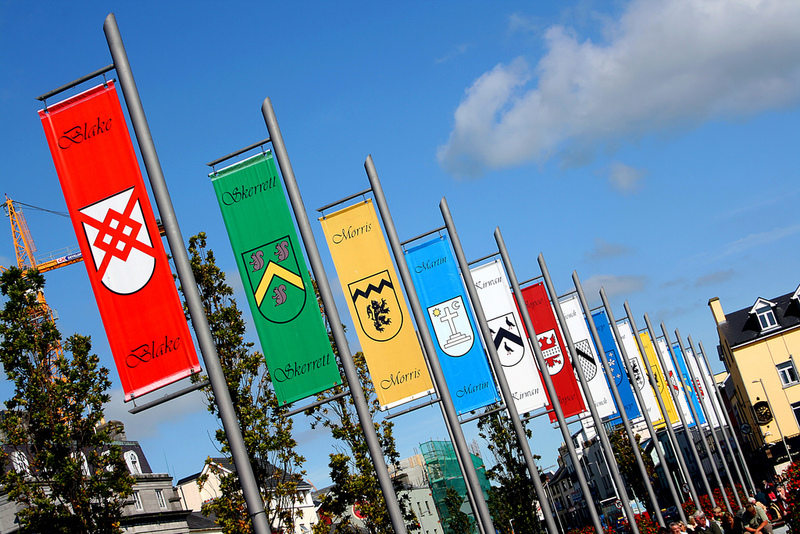 Galway is often referred to as the City of Tribes. This is reference to the fourteen tribes of Galway or the fourteen merchant families who once dominated Galway between the mid-13th and late 19th centuries. The fourteen tribes included the following families: Athy, Blake, Bodkin, Browne, D’Arcy, Deane, Font, Ffrench, Joyce (One of whom was Richard Joyce – Creator of the Claddagh Ring), Kirwan, Lynch, Martin, Morris and Skerritt. These families first came to Galway during the middle ages and had become very wealthy through trade with France and Spain. Most of these tribes were Anglo-Norman and considered themselves separate from the Gaelic natives that lived outside of the city walls. With their arrival they drove the Gaelic family the O Flaherties to the rough and wild landscape of Connemara. The O Flahertys became feared and on the surrounding wall of the city the words “From the Ferocious O Flaherty’s O Lord deliver us” were inscribed. These fourteen families had enormous influence in society in Galway and held huge political power and wealth. This is evident in the buildings they lived in. Lynches castle is a prime example of their extravagance with elaborate stonework carved into the building. Galway became an important trading port and life was busy and vibrant during these times. This all came to an end during the Cromwellian conquest of Ireland when the families were forced to surrender their properties. It was Cromwell’s forces that referred to them as “The Tribes of Galway” in attempt to belittle them, but in an act of rebellion and defiance the merchant families adopted the name. Today you can walk around the streets of Galway and see many relics from old Galway. In the city you can see Lynches castle, Blakes castle, St Nicolas church and the Lynch memorial window. Many streets, lanes, bars and restaurants in Galway also pay homage to these famous tribes.